Box Text: BE A LEGEND. I HAVE ALWAYS FOUGHT ALONE. 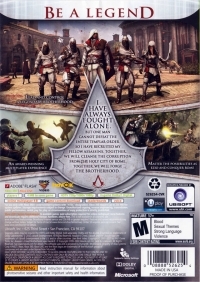 But one man cannot defeat the entire Templar order. So I have recruited my fellow Assassins. Together, we will cleanse the corruption from the holy city of Rome. Together, we will forge THE BROTHERHOOD. Lead and control a legendary brotherhood. An award-winning multiplayer experience. Master the possibilities as Ezio and conquer Rome. 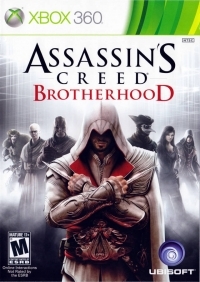 This is a list of VGCollect users who have Assassin's Creed: Brotherhood in their Collection. This is a list of VGCollect users who have Assassin's Creed: Brotherhood in their Sell List. 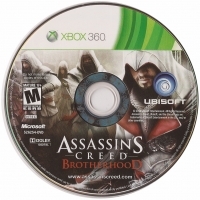 This is a list of VGCollect users who have Assassin's Creed: Brotherhood in their Wish List.